What kind of vehicle do you transport our dogs in? 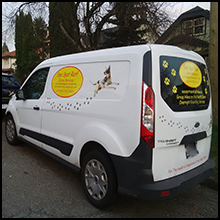 We know that heat in the winter and air conditioning in the summer are imperative for your dogs’ safety and comfort, and that having full access visually and physically to the dogs during transport is of utmost importance. 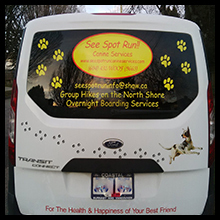 For these reasons, we transport our dogs to and from group hikes in our well maintained 2014 Ford Transit Connect. My dog has food or toy aggression. Can he come to your daycare or board with you? 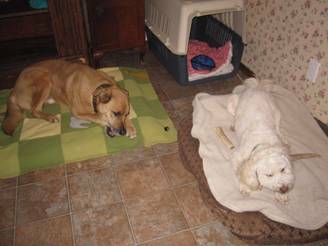 We request that you do not send toys, blankets, food bowls or beds when your dog comes to stay. We provide all of this, and they are all neutral to the dogs, which helps to prevent any resource guarding conflicts. As pack leaders, we teach our dogs how to share toys and what the rules are, and our new clients also learn from our seasoned guests. 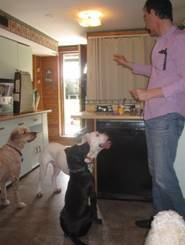 Alessandro feeds the dogs together in the k9 kitchen and always supervises the meals. We have taken in many dogs with “food aggression” issues, which we have helped them work through, enjoying their meals next to other dogs eating, which in itself, is a great way for canines to socialize! My dog is older than 6 months but is still intact as I plan to breed him. Can he participate on your group hikes or daycare? We do not accept intact dogs over the age of 6 months. 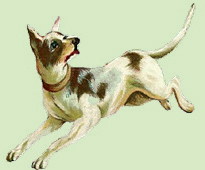 The scent and energy of intact dogs will cause upheaval in a dog pack, and we encourage all dog parents to spay or neuter their dog to prevent unwanted pregnancies and for the well-being of their dogs’ physical health and temperament.